My grandmother recently handed down this watch to me. It was a gift from her father. She believed she received it sometime between 1950-55, but it looks to me like it was manufactured in 1959 (though I'm not confident I'm correct about that). I'd love to know more about the watch. Thanks very much for any help you can provide. 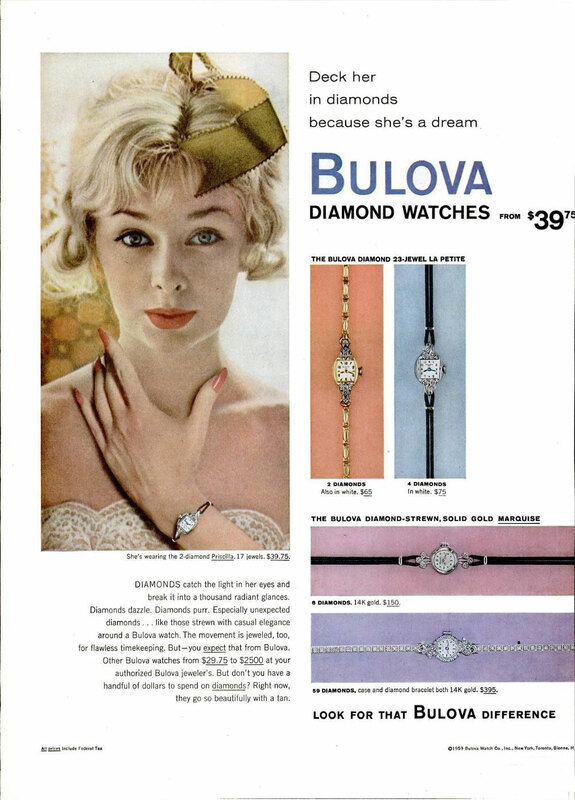 Database ad Daed 1959 http://www.mybulova.com/sites/default/files/vintage_ads/Bulova_AD_1959_2... lower right. Oh my gosh thank you! That is fabulous. My grandma is going to be so tickled. It really is beautiful - extremely delicate. The face is really only as big as the nail on my index finger. But it looks so lovely when its on. Thanks again! Nice watch. Tickle away :) Even looks like the original band. Wow, talk about BLING! Love it. A very nice and pricey watch! A true keepsake.